Resistance of a wire can be affected by various variables like thickness, purity, temperature, material and length out of which length is an important one. There is a direct relationship between the length of a wire and its resistance because as the length of a wire is doubled so is the resistance. 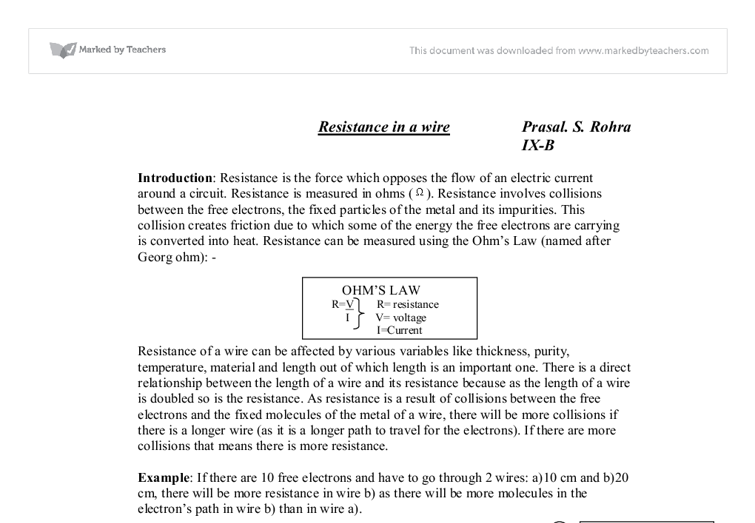 As resistance is a result of collisions between the free electrons and the fixed molecules of the metal of a wire, there will be more collisions if there is a longer wire (as it is a longer path to travel for the electrons). If I would do the experiment again I would also investigate other factors, such as temperature, voltage and current, and see how these affect the resistance. The author answers the question set thoroughly and with a good explanation of how the science involved would create the given results. They conduct several repeats of their measurements, which is helpful as it allows anomalies to be seen and means errors can be averaged out. The author mentions crocodile clips being incorrectly positioned as a possible cause for error, and taking repeat measurements as a way of removing this problem, but this would only be the case if the clips were repositioned each time. An easy way to ensure the wire lengths from which the resistance is measured is accurate would be by cutting them longer than required and marking the lengths on with permanent marker. When cutting the wire keeping it taut between two clamps would ensure the correct length was cut. The authorÃ¢â‚¬â„¢s level of analysis was good, but it could have been improved by adding more detail. The explanation of how resistance works was simple and effective, and I think it would have been more so had the intended diagram appeared in its complete form. At GCSE level I donÃ¢â‚¬â„¢t think I would have added much to this, but a description of resistivity might have added to the piece. While resistance is a property of the wire (it is affected by length, diameter etc), resistivity is a property of the metal itself. The author could have checked her results using this, allowing them to come up with a greater idea of the uncertainty in their results. 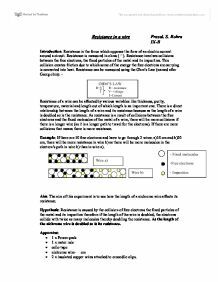 By multiplying the resistivity of the metal by the length of the wire and dividing by its cross sectional area, the author would have a measure of the expected resistance for that piece of wire, and could look at how her results varied from this. This would take their work beyond the content of the syllabus, showing that they read around the subject. The author should have looked into using a different power source if theirs kept shorting out, as only putting the equipment on for short periods of time would not give the readings time to settle. Alternatively, they could have changed the length of wire so the power source did not cut out. If I had conducted this experiment I would have done some preliminary plans to check the length of wire and equipment required. There was no circuit diagram visible in this piece, and this is necessary in a piece of coursework (as is the missing graph), but the former was certainly implied and if this was correct would have been a useful addition to the piece. The spelling, punctuation and grammar of this piece is generally good, with scientific vocabulary used to good effect. Generally the piece read fluidly, but sentences such as Ã¢â‚¬Å“The good thing I did in the investigation was that...Ã¢â‚¬Â could have been reworded so that the piece read better. This is a minor concern, and though it would probably not affect the writerÃ¢â‚¬â„¢s mark directly, if the whole piece reads well it gives the impression that the science itself is better. They both show a positive correlation once again supporting my prediction. The experiment was carried out correctly and successfully, I can say this because of the lack of anomalous points. Pentanol is the alcohol with the longest chain of molecules so therefore it has more bonds to break and more to be made. I also drew a sample of what I thought my line of best fit would look like. This turned out to be partially correct: the real line of best fit clearly shows the efficiency decreasing, but only after an initial increase before reaching 0.6N. My graph backs up these comments. room temperature as possible and waiting for a few minutes before I take my next reading to let the wire cool down). 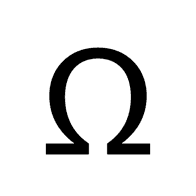 > The same voltage was used throughout the experiment. > The same apparatus-for example voltmeter, an ammeter, wires, variable resistor, power pack and crocodile clips. rulers, and they stand in exactly the same place for each experiment. This is why the same person drops the ball each time. This is why the rulers are held as straight as possible by two people to prevent human error in reading the results. The method that I used was quite a reliable one and there were not very many problems that occurred from carrying out the experiment, The amount of energy loss from heat and sound when letting the trolley/car down the ramp was more than I expected. There must be an increase in resistance. Current flowing through the conductor may encounter resistance. Any resistance they encounter inside the source is called the internal resistance which has removed energy from the charges before they have a chance to leave the source. This basically means wasting the source's energy.